We welcome today Julia Williams, who will be sharing with us her newest novel "The Summer Season," published in June 2011. 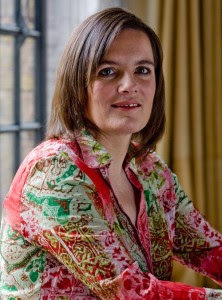 Julia grew up in North London, and is one of eight children, including a twin sister. She studied English at Liverpool University, where she met her husband, David. Julia began her career in publishing, starting with academic books and then moving on to children's books. She began focusing on writing after her second child was born. Julia also has a blog, Maniacmum, where she writes about the ins and outs of her mad life of being a mother of four. Julia and her family live in Surrey. You can visit Julia on Facebook, Twitter and at her website. JW: I'd like to say I'm dead organised and start writing at 9 and finish at 3 when I do the school run, but sadly that isn't so... I spend weeks, literally weeks procrastinating and hardly writing anything, then I panic and write like a demon till I've got a first draft finished. In my procrastination phase my house is very tidy. In my demon writing phase it isn't. Guess which my husband prefers? MP: What was the biggest challenge you faced while writing "The Summer Season?" JW: Writing the historical thread was really tricky. I love history and historical fiction, but am very conscious that I wanted it to be right. I nearly came very badly unstuck with making Edward an orchid hunter and sending him to India to hunt orchids, as I'd read it somewhere on a website which I then couldn't find again. Luckily the copyeditor picked it up and told me orchid hunting took place in South America, not India. That could have been dreadful. Getting the structure of the book was tricky too, as I was trying to weave the historical story in with the modern day story. Somewhere between first and second draft I had to do a lot of chopping and all my chapter nos changed around, so I found a really important bit of Edward and Lily's story hanging between two chapters of the modern day story which took place at a party and it really didn't work. Rewriting it so it did work gave me a huge headache! JW: I'm a keen gardener, so my favourite place to be in the world is in my garden, and I never have enough time to spend in it. But I also like walking, running and swimming and do work hard at keeping fit, as it's easy for writers to turn into sloths. Other then that, being with my family, as I as I am conscious that we may not have many more years all together. MA: If "The Summer Season" were made into a movie, who would you want to star in the lead roles? JW: Ooh, now that's really interesting. The hero for "Last Christmas" was inspired by Richard Armitage, so that would be an easy answer.... Hmm.. Let me think. Joel, I think could be played by someone like David Tennant, because I know he could bring out the depth of emotion, though DT wasn't in my mind when I wrote Joel. Or Jude Law. Jude Law would be good.. Kezzie I think needs to be played by someone quirky. I'd say Helena Bonham Carter but she's too old... Oh, I know, maybe Paloma Faith if she comes back to acting, or Gemma Arterton, and Lauren by someone like Claire Foy or Romola Garai. MA: You used to publish children's books. What is your favorite children's book of all time? JW: Another toughie... Not sure I have a favourite, as I love so many children's books, but probably the book I went back to more often then any other in my childhood was "The Lion, The Witch and the Wardrobe," so if I had to choose one book, I'd choose that. But also would include: "Tom's Midnight Garden," "Charlotte Sometimes," "The Dark is Rising" series and anything by Diana Wynne Jones. MA: Did you ever try switching places with your twin sister? If so, were you able to trick everyone? JW: Oh yes. Of course we did. What's the point of having an identical twin if you can't use it to your advantage? I once remember going into the park that backed onto our garden and changing clothes and coming back to trick our aunt who was pretty cross. But our most successful swap was one April Fool's Day when we were about 14. We spent the whole day in each other's classes and fooled nearly all the teachers. But I got terribly told off in Latin because I didn't understand any of it, and Ginia was top of the class, and she got shouted at by the poor Chemistry teacher for not having done her homework. The Chemistry teacher took a while to recover...In our adult lives we've often been mistaken for one another. I once met someone Ginia knew who wouldn't believe me when I said she must know my twin and got very annoyed with me! MA: What is something funny that one of your kids has said or done recently? JW: I was very bad tempered one day on holiday and told everyone to go away in uncertain terms. Now of course they're quoting my bad tempered comment "I'll be cross if I want to" back at me, which is pretty funny, if a little humiliating. MA: While you have soundtracks for your novels, what would be a song on the soundtrack of your life? JW: Easy peasy. "You Really Got Me" by the Kinks. It's my husband's and my theme song. MP: If you could travel anywhere in the world where would you go and why? JW: I've always wanted to go to Norway to see the Ffords, because they sound beautiful, and peaceful, so I guess I'd choose to go there. Although, there is so much of the world I haven't seen I think I want to take a middle aged gap year and travel once the children have left home. MP: What is one of your favorite childhood summer memories? JW: Oh so many. We had a little park at the back of our garden, and all the local kids would play out till 9 pm all summer long. I can also remember clearly that delicious feeling of having a whole six weeks away from school, and the disappointment as to how quickly it went. We didn't always go away for our holidays as my parents couldn't always afford it, but because my dad was a teacher he was always around, so we used to go out for great days out in London, which made up for it. My favourite family holiday was in Wales when I was about ten. We did lots of walking, and swimming, and had an hilarious encounter with some very plump nudists on a local beach. Thanks to Julia for visiting CLC and answering all our questions in such detail. Thanks also to Charlotte Allen for sharing Julia's book for our giveaway. 1. Please tell us: If you had to pick one movie soundtrack theme song that portrays your life, what would it be? Giveaway ends September 26th at midnight EST. I enjoyed Julia's comments, especially about her difficulties with tying in the historical thread and twin tricks! Thanks so much for the chance to win. 1. Soundtrack song -- "I've Had The Time of My Life" sounds like a perfect one! I don't know if there is a movie sound track that portrays my life; JAWS maybe - hidden depths & dangers. I joined Chick Lit Central on Facebook. Love Story theme would be good for my life. I linked to the description of the book, and was completely intrigued by the term "guerrilla gardener"! Loved it. So I'll toss my hat in the ring. Part of CLC on facebook. I'm going to say What A Feeling by Irene Cara for the movie Flashdance because I was chasing a music career for many years and now I'm not quite sure which direction to take apart from currently being a Mom and Wife. It's all about believing in yourself and listening to your inner voice and just going for it really so I will....as soon as I narrow down just what. I'm a follower. My song would be I've Had the Time of My Life. 2. I already follow this blog through GFC as Wonder Woman. 4. Already joined Chick Lit Central on FB as Angeline Rodriguez. My song would be the Apollo 13 theme. I follow the blog on both fb and blog. Great interview! Sounds like a wonderful book and why not extend summer? 1. "You don't bring me flowers anymore" from The Way We Were. 3. Belong to Chick Lit Central on Facebook.